Inspector blogging: Push the button. I am back in the Patrol Office for a little while. Actually it is the former Detective Superintendent's meeting room into which displaced staff at the station have moved whilst “building improvements” take place. The disadvantage is that I get easily distracted from important analysis and project management by chatting with the the Patrol, Neighbourhood, Public Protection, Alarm Fitters and Crime Management Hub staff. The advantage is that I get easily distracted from important analysis and project management by chatting with the the Patrol, Neighbourhood, Public Protection, Alarm Fitters and Crime Management Hub staff. 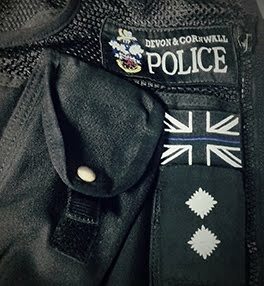 One morning last week I was lucky enough to chat with a Patrol Officer as he finished off his last night shift before his rest days. I would like to share with you his 'job of the set1'. He is a quietly spoken and friendly fellow with a ready smile and seemed to enjoy telling me how he got to “blow stuff up!”. That's not exactly how he described it, but close enough. You see, of the millions of tons of explosives we Europeans have thrown, fired, launched and dropped at and on each other over the last 120 years an unknown percentage did not go bang. On small item from that percentage, for an unknown reason was found in a remote rural corner of South East Cornwall. The finder called us, we called the Army, the Army called the Navy and in the way of things we sent a Patrol Officer to put up tape and 'keep the public safe'. Over the next four or so hours I like to think he may have seen a fox, some moorland sheep and ponies in the distance and perhaps an early Skylark or two. He didn't say. But he did say that the public, who may have had some kind of sixth sense, were not to be seen anywhere. In an impressively military way the Navy arrived, probably with a rubber boat on the roof rack. These guys always have a rubber boat on the roof rack. They might call it a de-rigged eight foot Gemini secured to a vehicle mounted boat cradle. I won't. Also, on arrival these guys always ask the police officer to move the tape back “another 50 yards mate”. They then have a huddle, look at the picture again, and put a bunch of explosives next to the bomb. They may use phrases like extend the blast area cordon, Render Safe Procedure assessment, disposal charges and munitions. I won't. Once the necessary had been done, the area thoroughly checked and the team were stood behind something solid, the “Navy bloke in charge” asked the Patrol Officer if he wanted to “press the button?” Who wouldn't? The sequence of events went something like this. Here it is worth pointing out that a police officer usually has to work out a “course of action” in confusing and volatile situations, using limited and unreliable information, often provided by emotional and sometimes chemically enhanced people, who have an agenda or worse. To have a crystal clear situation with unambiguous instructions is something just too lovely to ignore. The Patrol Officer immediately reached out, took the detonator, squeezed the handle and pushed the button. The small black plume of dirt propelled by white smoke jumped into the air, instantly followed by the intimidating boom and the satisfyingly chunky shock wave. Or that is how I like to think it went down. PS – I like to speak plainly. It has helped when I have been working out my own courses of action. PPS – Please drive safely even when you're a bit late, be kind to each other, and leave other people's stuff alone. 1“Set” in this context means a 'set' of six shifts worked as 2 days, 2 lates and 2 nights.